PAPAGAYO GULF, Costa Rica–SunVesta Swiss Holding Group began construction of a luxury resort in the Papagayo Gulf, in the northwestern province of Guanacaste, which plans to begin operations in late 2014. The new project, called Paradisus Papagayo Bay Resort & Luxury Villas, will have 382 deluxe rooms, nine restaurants, eight bars and a beach club. It also will have facilities for business meetings. The project replaces the Paradisus Playa Conchal hotel and is being built in cooperation with Paradisus Resorts, the flagship brand of Meliá Hotels International. 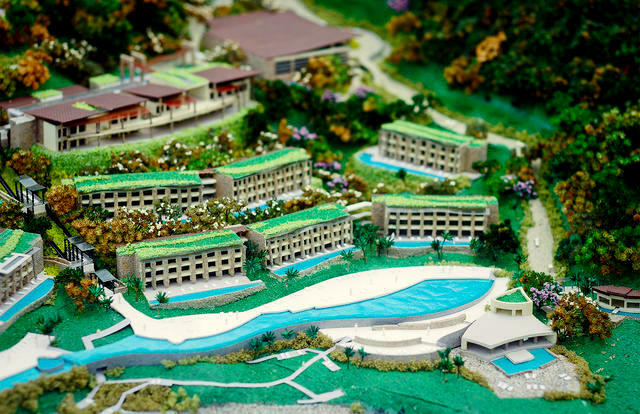 Total construction of Paradisus Papagayo Bay will cover 21 hectares and “meets all required specifications to qualify as five-star hotel,” the company stated in a press release. The new project, displayed here in a scale model, will have nine restaurants, eight bars and a beach club. This entry was posted in Costa Rica, Costa Rican Riviera, Guanacaste and tagged Guanacaste, Melia, Melia Paradisus, Papagayo Gulf. SAN JOSE, Costa Rica–AviancaTACA announced today the cancellation of five flights to the San Jose hub: Los Angeles, New York-JFK, Havana, Monterrey, Quito and Guayaquil. Effective tomorrow passengers will need to use the El Salvador or Bogota hubs when flying from any of these cities (except Monterrey that is being totally cancelled). The Costa Rican airline LACSA started a flight connection hub in the late 1970s that included flights from Miami, New Orleans, Dallas, Los Angeles, San Francisco, New York-JFK and Toronto. After the merger with TACA some of these cities were cancelled transfering the operations to El Salvador. WIth the merger of TACA and Avianca of Colombia, the Costa Rican hub will be minimized transfering most of the non-stop flights to El Salvador, Bogota and Lima. The Juan Santamaria International Airport was the original LACSA hub since the late 1970s. After the merger with TACA and Avianca the hub will be minimzed. This entry was posted in Costa Rica, Latin American Airlines, Latin American Airports, Uncategorized and tagged Avianca, Juan Santamaria International Airport, LACSA, TACA.